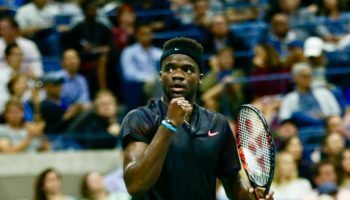 Will an American fan favorite keep his tennis career going today? 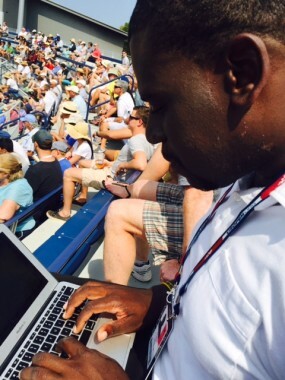 In the afternoon session of Day 3 at the U.S. Open, A Lot of Sports Talk‘s live blog will start at Louis Armstrong Stadium, as Mardy Fish, who announced that this year’s U.S. Open would be his last competitive tournament on the ATP Tour, looks to stave off heading into the tennis sunset when he faces the No. 18 seed, Feliciano Lopez. Fish, who at one point reached a high of No. 7 in the world and competed in the ATP World Finals in 2011, has his career interrupted by an anxiety disorder. But the crowd, which is at a fever pitch here on Armstrong (we’re typing in here as we speak), definitely will have a part in helping him through this match, regardless of the result. Also, we’re going to head to Court 9, where Julio Peralta and Matt Seeberger, the U.S. Open National Playoffs champion in men’s doubles, plays in their first U.S. Open together, against tour veteran Santiago Giraldo of Colombia and Rameez Junaid of Australia. It’s time to get blogging! Again, tell us where to go and we’ll be walking over there and reporting from the match for a few games. It’s an overcast day here in New York, but any day on the tennis courts without rain (or sleet or snow or wind) is a beautiful day! 12:22 PM EST: It’s time to catch the bus back to Manhattan! Stay tuned to this page for interviews from Day 3, including one with Fabio Fognini. This is our last day here, so we bid you adieu! Thank you so much for being with us the past three days, and we’re sure to see you around the grounds once again in the near future! 11:53 PM EST: Well, here’s us in the photographer’s pit during Nole’s match. How about this view? 11:48 PM EST: As you see very shortly we were able to take in some of the match in the photographer’s pit on court level. Obviously, the best part of it was…everything! The mouse trap next to us didn’t dampen our mood at all in being in the bowels of the stadium. The only thing that was a little bit of a downer was being drilled in the left shoulder with a ball after a 123-mph serve from Haider-Maurer went past Djokovic and through the opening on the back wall. A nice little battle scar is sure to develop shortly. 11:48 PM EST: So Venus Williams needed a third set to pull out the match against Falconi, and now will take on the No. 12 seed Bencic. In the nightcap at Ashe, Novak Djokovic did what Novak always does on hardcourt; dominate, as well as put on a show for the fans afterwards. His 6-4, 6-1, 6-2 win over Andreas Heider-Maurer was followed by a little impromptu dance with a fan who’s known to entertain in the stands during changeovers by dancing on the aisle steps while Billy Idol’s “Mony, Mony” blares on the loudspeaker. No, it’s not the Russian flag, as some passersby said “Let’s go Russia” as I took these pictures. 8:46 PM EST: And that’s it! After a routine hold from Doi, Bencic holds without too much issue and wins the third set, 6-3, and the match! Win over Serena in Toronto might have been her biggest career win, but this one could be her grittiest ever win. Again, after being down three match points in the second set, she claws back to win! She will play the winner of Venus Williams and Irina Falconi, and that match is 5-all in the second set after Williams won the first set, 6-3. 8:37 PM EST: One last Doi forehand error and Bencic is now one game away from an amazing comeback. Remember, she was down three match points in the second set at 5-7, 5-6, 0-40. 8:36 PM EST: No one seems to want to win this game with their play and the amount of errors from both. Another Doi winner, this time form the backhand, and it’s deuce once again! 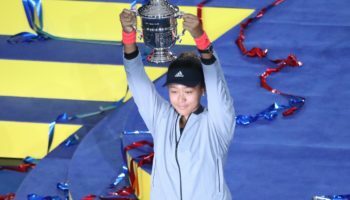 8:35 PM EST: The Japanese’s forehand has left her, as another easy forehand that she has at the service line is dumped into the net. 8:33 PM EST: Doi yo-yoes Bencic around the baseline, but hits a forehand at the net long, and a golden chance to get back on serve wasted. 8:32 PM EST: Another down-the-line forehand winner wipes out another game point. Forehand error on next point gives Doi a break point chance. Racket smash from Belinda after error. 8:31 PM EST: Doi wins first two points on Bencic serve in this seventh game, but Belinda, with a couple of aces, gets to game point…which is wiped out with a Doi forehand winner down the line. 8:28 PM EST: Doi holds at 30. Bencic still up a break, 4-2, in the third. 8:23 PM EST: Bencic holds. 4-1 to the Swiss in the final set. 8:22 PM EST: Another unforced error from Belinda and Doi can get right back in this set. She has break point…which is wiped out by a backhand down-the-line winner from Belinda. Bencic with a primal scream afterwards. 8:21 PM EST: It’s now deuce after a Bencic running forehand is dumped into the net. 8:20 PM EST: Bencic follows with an ace for 30-30. A backhand error from Doi and it’s game point for Belinda. 8:18 PM EST: Doi holds to get on the board for 1-3. Bencic goes up 15-0, then double faults. Do with a forehand swinging volley winner and Doi now has a chance at the break. 8:16 PM EST: I might have said it last year, but it’s weird to see a Japanese player that’s left-handed, especially given the usual reservations Japanese parents have in having their children growing up left-handed. I’m pretty sure Kimiko Date-Krumm was originally left-handed until her parents intervened while growing up. 8:13 PM EST: It’s all coming apart for Doi…or it’s all going right for Bencic. The Swiss runs out to a 3-0 lead in the third, breaking Doi in the second game and holding serve after being forced to deuce to consolidate her break. 7:55 PM EST: Well will you look at this? I run to Court 11 to watch, I think, the end of the Belinda Bencic/Misaki Doi match, as Doi held triple match point. But Bencic fights out of that hole, holds for a tiebreak, then wins the tiebreak, 7-3, to force a third set! Now to run back to the media room to pick up my laptop, as my Kindle is barely picking up any Internet connection. Rats! 7:20 PM EST: Whew…just in time! Here at Court 17 just in time for Kukushkin to close out Baby Fed, 6-4 in the fifth. It’s not been a great year for Dimitrov; after two quarterfinals and a semifinal in the four Grand Slams, Grigor fails to even make one quarterfinal this year. What’s the deal? Anyone want to chime in about Baby Fed? 6:54 PM EST: Possible change of plans, as we have just seen that No. 12 Belinda Bencic, maybe the hottest player on the WTA Tour going into the U.S. Open, just lost the first set on Court 11 against Misaki Doi of Japan. It was a pleasure watching Bencic being able to outlast Serena in Toronto, and then following that up by continuing to win until taking home the Rogers Cup championship trophy. Should it be Court 11 or 17 now? Deciding as I’m walking out onto the concourse! 6:40 PM EST: Our sincere thanks to our newest reporter, Amy Kovalchick, for joining us in our galavanting yesterday. She just sent some pics she took, and they’re fantastic! Here you go…. Amy’s not only just a great person, but also an official ALOST contributor! 6:26 PM EST: Time for another pit stop at media dining room, then out to Court 17, where No. 17 Grigor Dimitrov is looking to win the fourth set and force a fifth after losing the first two sets against Mikhail Kukushkin. 6:15 PM EST: A little gamesmanship at match point, as Hercog asks for towel right as Bouchard wsa tossing the ball to serve. Bouchard then gets towel herself right after. After 40-15, Hercog forces deuce, but Genie holds on after Hercog forehand goes long. Genie wins consecutive matches for the first time in a long while. 6:05 PM EST: On the awesome Grandstand, in time to see Eugenie Bouchard hold for a 5-2 lead. Hercog, who has a hammer of a forehand, holds for 3-5 now. After game, “Let’s Go Genie” chants ring out from some of Genie’s Army. 5:50 PM EST: Busy last 30 minutes: Serena wins, and then I’m busy running around interviewing Peralta, Seeberger and Fabio Fognini, who admitted to me he’s an Inter Milan fan in Serie A. All those interviews to come. Running to Grandstand now to see if Eugenie Bouchard can close out Polona Hercog of Slovakia. After splitting first two sets, Genie is up 4-0 in the third. 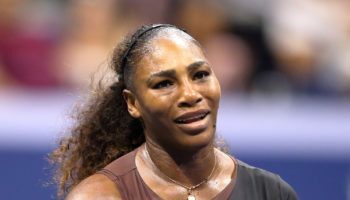 4:57 PM EST: Now that Serena has won the first set in a tough tiebreak (7-5), guess I should not worry anymore about an upset in the making. Or am I speaking too soon? 4:45 PM EST: Hold on! 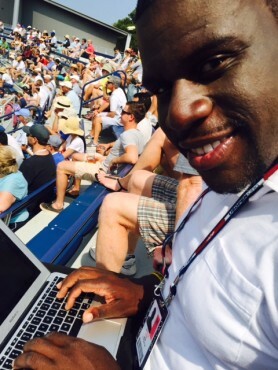 Serena was down a break on Ashe? What?! 4:20 PM EST: Staying mostly in the media area now as I’m running around like a madman to get some interviews for later. It can’t be just all text on here…wouldn’t be fun at all! 3:35 PM EST: Hanging out with the Seeberger and McNabney (Kelly’s side) family. Great people. Matt just was greeted by people whom, according to him, he hadn’t seen since high school. Matt’s a superstar! 3:20 PM EST: The end of the match was borderline bananas! Seeberger and Peralta go up 0-30 in an attempt to break and stay alive in the match, pretty much are up 0-40 if not for a couple of great scoops off the ground by their opponents, go up 15-40, then have an out call on a serve at 30-40 overruled to force deuce, earn another break point chance, lose it, then finally lose the game and match when a Seeberger shot goes wide. What a wild ride! Again, congratulations to Matt and Julio. It was a pleasure following them from New Haven to New York. Matt said they’ll probably take a trip to Holland in two days and play in a challenger event there. Wish you luck, guys! 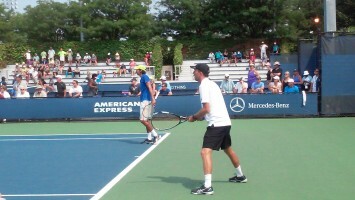 3:05 PM EST: Giraldo and Junaid break right back, however, and they’re one game away from the match. Peralta has just called for the the trainer. Might be cramps. Players now back on to the court. 3:00 PM EST: I can’t take the drama! Seeberger was broken at 3-all, but his team got it right back! 4-all now. Pass me a Maalox!! 2:35 PM EST: Giraldo and Junaid hold on and win the second set, 6-4. Giraldo takes a bathroom break, which gives us time to charge our phone, as well as let you know that time has officially been called on Mardy Fish’s career, as he lost the fifth set, 3-6, to Lopez. Bravo, Mardy! 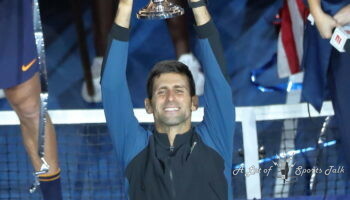 Can’t help but be emotional thinking about the end of a career of a really good tennis player and a great person! Wish you well in all of your future endeavors, Mardy! How about broadcasting?! 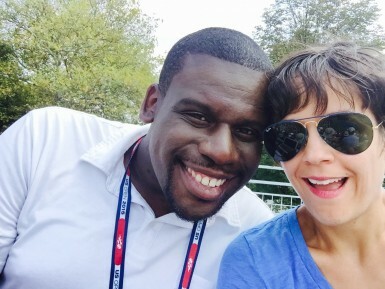 There’s a spot available with us for a tennis analyst, you know?! 2:08 PM EST: I feel somewhat bad that I’m here still on Court 9 when Lopez and Fish are in a fifth set, but the Seeberger family is a somewhat superstitious lot…superstitious as in Kelly might beat me down if I leave now while they’re ahead. Asked Kelly what she thought about her husband winning the first set, and she wouldn’t talk about the match just yet. But I’ll have an eye of the scoreboard for you on the Fish match. 2:04 PM EST: The Seebergers and Co. are from all over: Vancouver, Toronto, Washington (state),San Francisco. 2:00 PM EST: Not only did Peralta get out of that hole, saving two break points in the process, the team broke the next game and have won their first ever set at the U.S. Open. How about that?!? 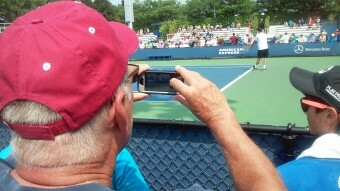 1:46 PM EST: We’ve finally made it to Court 9, and we’re sitting with the Seeberger family, as Matt (Seeberger) and Julio Peralta have started their match – and their first U.S. Open – in good form. Both Seeberger and Peralta have held their first two service games, and it’s 4-4 (with Peralta serving now). And I’m jinxing them, as it’s 0-30. 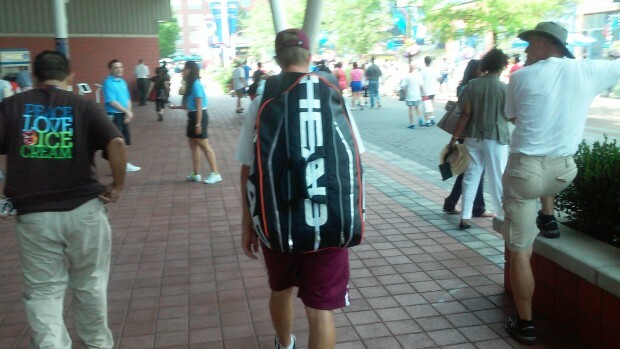 12:58 PM EST: Before getting on to Court 9, here’s a nice picture we snapped on Court 7. Here’s Pablo Carreno Busta, who took out Jerzy Janowicz in the first round, toweling off while playing his second round opponent, fellow Spaniard and No. 23 seed Roberto Bautista Agut. For those who don’t like players toweling off almost after every point, my apologies for posting this picture. 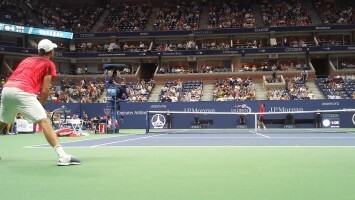 12:51 PM EST: Crowd erupts as Fish only loses that one game in the third set and closes it out, 6-1. 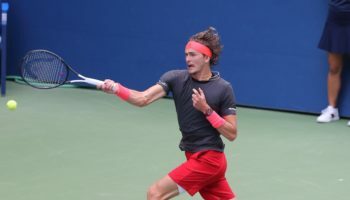 Fish reached the fourth round of the U.S. Open in each of the last three years he competed here (2010, 2011, 2012), and he’s one set away from the third round here in his tennis swan song. Armstrong plans to get even louder, but, as of now, we’re headed to Court 9.